Valentine’s Day is soon upon us. I follow many teachers on Instagram, including elementary teachers. Yes, I teach high school English, but I love seeing all the bright, and engaging bulletin boards these many talented teachers create. One such bulletin board caught my eye. It was titled: Random Acts of Kindness, and it featured red foil little hearts each filled with a special message. I think my high school students would love a little project like this, and furthermore, we all need lessons in kindness and empathy. I found a great TED Talk: BUILDING EMPATHY: How to hack empathy and get others to care more. The students will watch and discuss this TED Talk, then they’ll collaborate with a partner to come up with random acts of kindness. I created some simple heart shapes in PowerPoint. I printed these on various colors of Astrobrights paper. I cannot wait to see 100s of these little hearts scattered all over the classroom walls. I’m hoping my students will glance at them from time to time, and maybe, just maybe they’ll actually perform some of these acts of kindness. Do you have anything special planned for your students on Valentine’s Day? 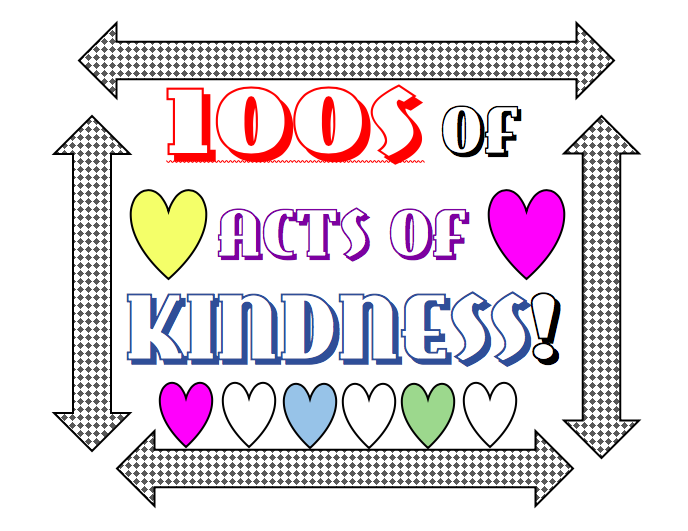 Previous Valentines Day–What Better Day to Promote Acts of Kindness? Next Stay home if you’re sick! What a lovely idea. We can never spread too much kindness. Happy Valentine’s Day!